Hattiesburg was incorporated in 1884. The town grew as a stop on the railroad between Meridian and New Orleans, and became a commercial center of the regional timber industry. The Jewish community of Hattiesburg got a relatively late start. Jews did not begin to arrive in the “Hub City” of southeast Mississippi until the early 20th century. According to one account, Maurice Dreyfus was the first Jew to settle in Hattiesburg, arriving in 1901 from Brookhaven, Mississippi to operate a saw mill. Soon after, Dreyfus was joined by growing numbers of Jews drawn to the town’s economic potential. Many of these newly arriving Jews were immigrants from the Russian empire. The Jewish community developed throughout the 20th century and continues today. Many of the early Jews in Hattiesburg owned retail stores. Frank Rubenstein arrived in Hattiesburg in 1906 at the age of 22. He opened a store called “The Hub” and also owned a store in Sumrall, Mississippi, which was managed by his brother-in-law. In 1919, the Hattiesburg American newspaper called Rubenstein “one of the leading merchants of the city” and reported that he was planning on expanding his store by buying a larger building in downtown Hattiesburg for $31,000. Upon purchasing the building, he transformed the four existing businesses into one store, creating one of the largest department stores in Hattiesburg. By 1919, many Jewish-owned stores were advertising their closing for the High Holidays in the local newspaper. These stores included The Globe, The Leader Family Outfitters, L. Rubenstein & Co., Adler Dry Goods, and S & H Katz. Interestingly, all of these stores closed for two days for Rosh Hashanah, showing they were traditional in observance, but were reopened on Saturday, which reflects the compromises that even observant Jews had to make to thrive as retail merchants in Hattiesburg. ​A major commercial figure in Hattiesburg was Louis Buchalter, a well-loved tailor. A native of Jablonow, Poland, Buchalter came to New York in 1911, following his Aunt Fannie, who had arrived several years before. Upon arrival in New York, he found himself working from 7:00 am to 7:00 pm for only one dollar per day. He soon heard of a job opening in Natchez, Mississippi, and so moved to the South, where he met his wife Jennie Saltzman. After they married, the couple moved to Hattiesburg with $75. Buchalter soon opened his own tailor shop called Louis Tailoring Co. in 1915. It was in this store that Buchalter became an important figure in the town. He took great care and pride in his suits, tailoring for fifteen years without the aid of a sewing machine. Even after he purchased a sewing machine, it was used only for alterations. Though originally all of the suits from Louis Tailoring Co. were hand sewn, as the demand for Buchalter’s work grew, he had to begin buying ready-made suits, limiting his hand-sewn suits to special occasions only. 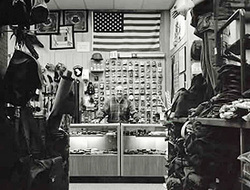 In 1982, after 68 years of business in the same location on East Pine Street, Buchalter closed the store due to his declining health. In 1915, the Jews of Hattiesburg organized Congregation B’nai Israel as the city’s first and only Jewish house of worship, though there is evidence that Jews had worshiped together informally long before the temple’s founding. In 1908, 15 Jewish men had founded a local chapter of B’nai B’rith. Jewish women in Hattiesburg founded a chapter of Hadassah in 1939. The 1917 opening of Camp Shelby 15 miles south of Hattiesburg had a significant impact on the community. Thousands of soldiers from the around the country have received their training at Camp Shelby, and the base helped make Hattiesburg into one of the largest cities in Mississippi. Many Jewish soldiers from the North were stationed at the camp during wartime and members of the Hattiesburg Jewish community often hosted them for Passover seders and other events. Hattiesburg Jews were also active in World War I, World War II, and the Vietnam War. B’nai Israel’s cemetery commemorates five members who fought in World War I, four who fought in World War II, and one who fought in the Vietnam War. Hattiesburg Jews have been very prominent in the community. Jerry Shemper, a longtime local business leader, has served on the Hattiesburg city council. His wife Linda has been active in the Forrest County Democratic Committee. Herbert Ginsberg was a local lawyer who was a law partner of Paul Johnson, who served as governor of Mississippi in the 1960s. Ginsburg served as a U.S. Magistrate during the 1960s. 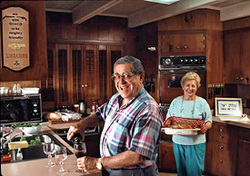 His wife, Lou Ginsberg, was very active with the region’s Jewish youth. She spent many years as the regional advisor for the Southern Federation of Temple Youth, and worked at the Henry S. Jacobs camp for 24 summers. Maury Gurwitch was a successful local businessman and has been treasurer of B’nai Israel for over 15 years. Hattiesburg has remained a relatively small but stable Jewish community. In 1937, 215 Jews lived there. In 1984, 180 Jews still lived in Hattiesburg. By 2001, this figure had only declined to 130. While retail business ownership was almost universal among Hattiesburg Jews in the early 20th century, today, only one, Sack’s Outdoor Store, remains. The Jews of Hattiesburg remain a vital part of the community.